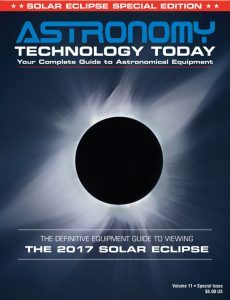 For those looking for equipment to observe the 2017 Great American Eclipse in August, a group of companies have created a new website – Total Eclipse 2017 (TSE17.com) – to provide a one stop resource to purchase eclipse viewing equipment. Companies that are participating in the website include Lunt Solar Systems and APM Telescopes. Products available include: standard eclipse glasses, special eclipse glasses, Solar binoculars, binoculars with Solar filters, Solar filter and foils and more. Of course you should never look at the sun without adequate protection. The solar observing products offered on the site are 100-percent ISO certified Solar Safe to ensure safe viewing. For those who would like to use their smart phone/tablet, DSLR camera, binoculars or other equipment, the site offers Solar filter film to be attached for safe observing. You can visit www.tse17.com to learn more.